Output frequency: 0.00 ~ 120.00Hz, offering output torque of more than 150% when at zero speed. The vector control by FOC, enabling smooth and comfortable operation of the elevator. S-curve acceleration/deceleration and battery for abnormal power shut-down. Overload capacity: 150% of rated current for 1 minute and 200% of rated current for 10 seconds. 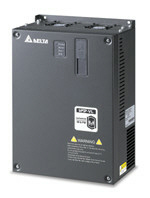 Complied with EN954-1 (safety-relay) standard. The built-in brake module saves you installation space and cost. Built-in with Modbus/CAN bus communication interface. With optional LCD digital keypad and PC tuning software. Home elevator, cargo elevator, passenger elevator, residential elevator and crane.